He never played basketball while attending Nashville’s Franklin Road Academy. 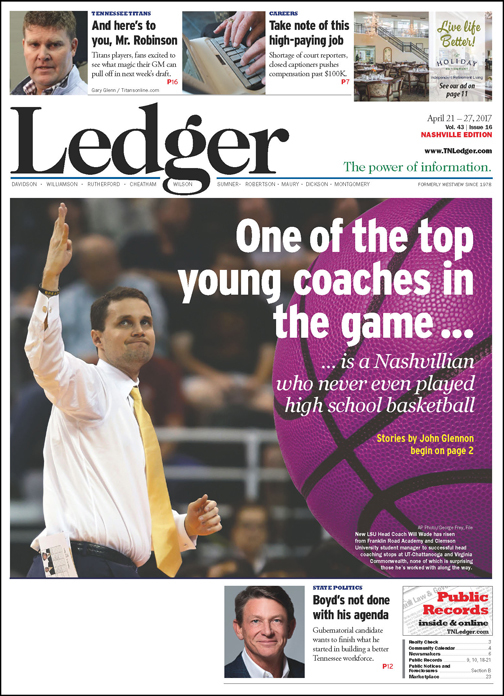 But those close to Will Wade insist he was giving subtle indications – even back then – that he was future head-coaching material. Maybe it was the fact Wade spent all four of his high school years serving as an FRA student basketball manager. Maybe it was the way he would sidle up to players during practice, reminding them to bend their knees or tuck in their elbow while shooting free throws. Or perhaps it was the game-day attire he wore even as a freshman, a nicely pressed button-down and sweater vest that might have come straight from a coaching catalog. It’s hard to argue that theory these days as Wade – still only 34 years old – has become one of the hottest young names in NCAA basketball. LSU named Wade its new men’s basketball coach last month, thanks to an impressive resume that includes turning around a bad University of Tennessee at Chattanooga team in just two years and then guiding Virginia Commonwealth University to back-to-back NCAA Tournament appearances. His new job will be Wade’s first guiding a Power-5 conference program – the SEC advanced three teams to the Elite Eight last season – but he sounds too busy to be worried. “You just have to put your head down and go to work – you can’t worry about all those external factors or all the noise on the outside,” Wade explains. “All you can do is focus on doing the best job you can. During his college days at Clemson, Wade envisioned a simple plan for his future: Earn a degree, teach high school history and coach boys basketball. What could be more fulfilling? 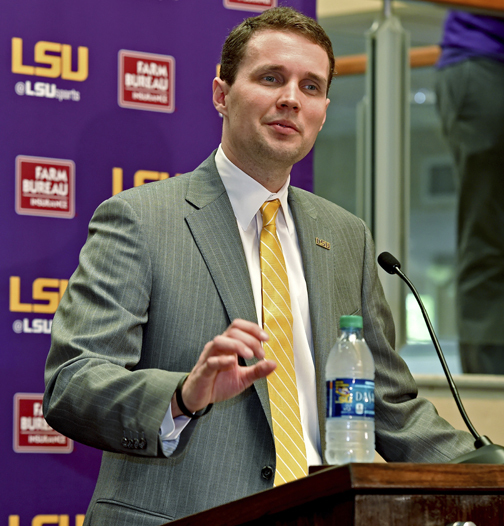 Nashville native Will Wade is introduced as LSU’s new head basketball coach at a March press conference. He previously served as head coach at UTC Virginia Commonwealth. But the closer Wade got to graduation the more that former Clemson basketball coach Oliver Purnell realized he didn’t want Wade – who’d spent the past four years as Clemson’s hard-working student manager – leaving campus. Instead, Wade spent the next two years as Clemson’s graduate assistant/director of basketball operations, parlaying that experience into an assistant post at Harvard under Tommy Amaker. It was there that Wade’s work ethic impressed former Crimson players like Jeremy Lin, now a guard for the Brooklyn Nets. Wade helped Amaker recruit a top 25 class for Harvard before moving on to VCU, where he spent four years as an assistant under head coach Shaka Smart. Then it was time for Wade’s biggest test, and in 2012, he took over a Chattanooga program that had posted just one winning season in the previous five years. His very first recruit, point guard Greg Pryor, says Wade’s non-stop enthusiasm helped pump vitality into the Mocs. Chattanooga posted a 40-25 overall record in Wade’s two years there, racking up a 27-7 mark in the Southern Conference. Wade was even more successful with an established program at VCU, guiding the Rams to a 51-20 record and back-to-back appearances in the NCAA Tournament. That brought his four-year coaching mark to 91-45, sharp enough to attract LSU. In addition to the passion and energy Wade has brought to each of his stops, he’s also embraced the analytics side of the sport, to the point that he has one of the nation’s top metrics gurus – Ken Pomeroy – send detailed breakdowns of each of his games within hours of the final buzzer. “He would stay up that night after the game, just analyzing and analyzing,” explains Gene Frenette, Chattanooga Times Free Press sports writer who covered the Mocs when Wade served as head coach. “He loves that stuff. If you look at the Xs and the Os when you watch his team play, he always seems to be one step ahead. Wade’s willingness to try new things may stem from his somewhat unique background, the fact that – unlike many coaches – he didn’t play the game on the high school or college level. “I think it’s an advantage in that I’m able to come at things from a different angle – I don’t just accept what most people might consider basketball norms,” Wade points out. Wade will need every advantage he can get in the coming year as he seeks to turn around an LSU team that finished 10-21 overall last year, 2-16 in the SEC. The Tigers have reached the NCAA Tournament just once in the past eight seasons. But after playing two seasons under Wade as his first recruit – and watching Wade’s quick climb up the coaching ladder – Pryor has no doubt his former coach will be just as successful at his third stop. “Seeing the great things he did at VCU in two years, I knew it was only a matter of time until something big came up,” Pryor says.